Our first Christmas with a baby was totally overwhelming – especially where presents were concerned – and we hadn’t even given him anything from us! He had 30 + presents to open on Christmas Day, and needless to say we were all a bit sick of opening them – but everyone insisted on them being opened in front of them! That’s all before we had time to digest exactly how many toys we’d inherited, let alone where we were going to put them all – and the PLASTIC!!! We were just helping to destroy the planet little by little! He was more interested in the paper and boxes the presents came in rather than the presents themselves – and I hated just how much plastic came with everything and how damaging that was to the environment – the complete opposite of sustainable living. I was very uncomfortable with it all. I get it, I really do – new baby in the family and everyone wants to spoil him, but sometimes I feel as though people buy presents for the sake of it – which is not what I want him growing up expecting – huge quantities of gifts that are all expensive! I had a great childhood, and received relatively little at Christmas, but I truly didn’t expect anything, and therefore was extremely happy with what I did get. I see some adults now who did receive tons of presents, and to them, christmas is all about presents – to the point where people get themselves into debt! So last year, and again this year, I put my foot down after seeing a really interesting article talking about the ‘four gift rule’. The rule is that people buy children something they ‘want’, something they ‘need’, something to ‘wear’ and something to ‘read’. I was met by some surprised faces when I suggested it, and i’m pretty sure the word grinch was used to describe me on more than one occasion. But, with two sides of the family, and friends who want to buy him presents, something had to be done. It was MUCH more manageable, and we ended up with so much less ‘tat’ – plus it made us appreciate the presents that were received, and because of the categories – much more thought was put into the process. I don’t want the little man growing up thinking christmas is about how many presents people buy, or who spends the most on christmas gifts – I want him to grow up being appreciative of family time, and the thought that goes into present buying – something I think a lot of people have completely forgotten about in this era! I’m a full time working mum – I want my little boy growing up appreciating everything that we buy him, and realising just how hard mummy and daddy work to afford the things we are able to buy him. I’m not a grinch, but i’d rather use money on experiences and memories rather than plastic toys which after they’ve had their 10 minutes, will be shoved in a box somewhere and forgotten about. How do you manage christmas presents for children? 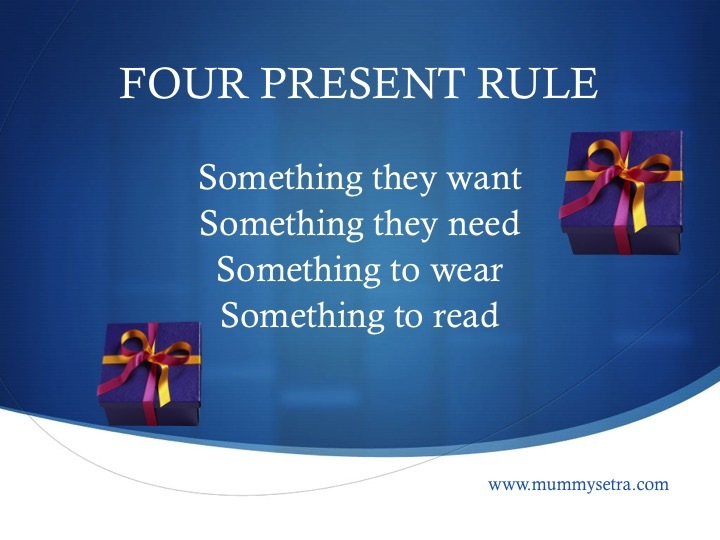 Have you ever used the four gift rule?